Whistler is a town in British Columbia, Canada. It’s located in the Pacific Ranges of the Coast Mountains. The town is fairly small with only about 10,000 permanent residents. There’s also a rotating population of people from outside Whistler who come into the town during certain seasons to work. The town is very popular for its mountains. In fact, about two million people each year visit Whistler. The primary season for visiting is the winter season, obviously. This is when people love to ski and snowboard. However, it is also popular during the summer. Mountain biking and hiking are very popular sports in Whistler during the summer. In fact, the town is so popular and so well-suited for sports that Whistler hosted many of the events during the 2010 Winter Olympics. The town itself was actually designed to attract the 1968 Winter Olympics. Through some political means, the bids never actually materialised, but the town was built. That means, from its inception, the town was designed as a great ski resort. The hotels are built with all of the luxury amenities that you come to expect. Perhaps most importantly, they are placed close to the ski slopes as well as easily accessible by road. Many ski resorts have hotels that might be nice, but they have to compromise between easy access to the slopes and accessibility by road. That’s not the case with Whistler, since it was designed as a ski resort. 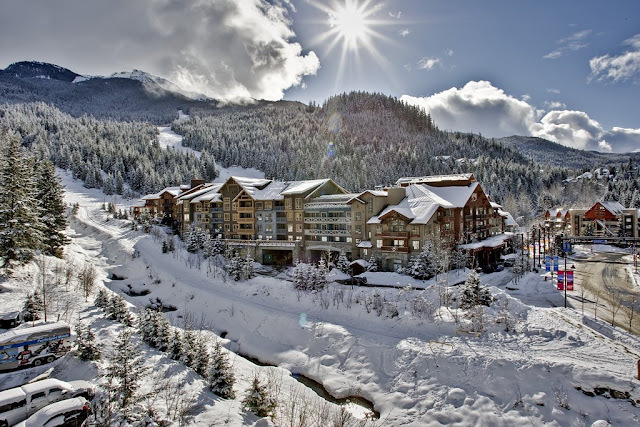 Luxury ski hotels in Whistler are perfectly placed for your enjoyment. The hotels in Whistler are typically built on or near British Columbia Highway 99. This is also called the Sea to Sky Highway, because it travels from the coast all the way to the mountains. The highway is a very well-maintained and well-travelled one. Also, the Whistler railway station and the Whistler Mountaineer offer regular rail service to and from your hotel. They are provided by Canadian National Railway Services. In addition to driving or taking a train, you could also take a bus. Greyhound Canada serves large parts of the country and provides passenger service to the mountain, so you could take a bus pretty close to your hotel. The quickest way to get to your hotel would be to fly into Vancouver and make the 140-kilometre trek to Whistler. The hotels in the area are designed specifically for skiers and winter athletes. That means, they are located close to the most desirable skiing locations, they’re well-maintained, and they can provide you with all the information you need to learn to ski or to get your skis fixed. Just as the concierge can tell you about the best restaurants and entertainment spots in the town, he or she can tell you about the best places to ski. Also, you can find the best pro shops that will outfit you with new gear or repair your damaged gear. Since the town is so small, none of this will be very far from your hotel.